WASHINGTON (March 14, 2003) -- Two Air Force leaders testified before Congress on March 13 about the effects of environmental encroachment on the service's mission. In separate testimonies, Air Force Vice Chief of Staff Gen. Robert H. "Doc" Foglesong and Assistant Secretary of the Air Force for Installations, Environment and Logistics Nelson F. Gibbs explained recent proposed changes to environmental laws by Department of Defense agencies. Those changes ask for clarification in certain laws as they apply to the military and are intended in part as a way to deal with environmental encroachment. Gen. Robert H. "Doc" Foglesong, Air Force vice chief of staff, testified before a senate subcommittee March 13 regarding the effects of environmental encroachment on Air Force readiness. Environmental encroachment occurs when the military's ability to perform its mission is affected by environmental laws, Gibbs told the House Armed Services Committee subcommittee on readiness. "Currently, 78 federally listed, threatened and endangered species occupy substantial portions of the approximately 9 million acres of Air Force property," Gibbs wrote. In one example, at the Barry M. Goldwater Range in Arizona, the Air Force monitors the movements of the endangered Sonoran Pronghorn. If that particular species is spotted near a target , the live missions projected for that target are diverted or canceled. 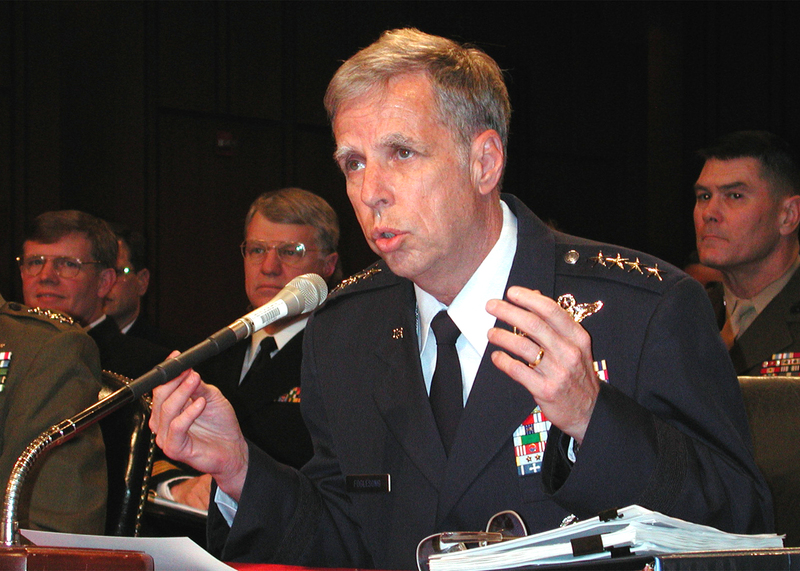 Other forms of environmental encroachment occur when compliance with clean air laws means new missions cannot come to an Air Force installation, or when commercial and residential development on properties around an installation are cause for the Air Force to completely change its existing mission, Gibbs said. Gibbs emphasized to the subcommittee members that the service is doing its part to preserve the environment. He explained that environmental stewardship and the Air Force mission can, and do, coexist. "The Air Force is a very good guardian of our natural resources, and we believe this is not a case of competing, but rather of working together rationally to ensure that we get the best of both," Gibbs said. The general later echoed that sentiment to the subcommittee when he explained the balance between the Air Force mission and the need to be environmentally conscious. "I think we have been good stewards of our environment," Foglesong said, "bBut we also have this balancing act of trying to be good stewards of readiness for our sons and daughters. I don't see those two things as incompatible." To ensure Air Force pilots are mission ready, the service must make sure adequate training ranges are available, he said. "I will say that our ranges are absolutely fundamental, in fact even critical, to our success," Foglesong said. "I was recently in the Persian Gulf and had been talking with one of the fighter pilots who had just returned from a mission and had just dropped a 500-pound bomb on a gun emplacement that had been shooting at him. "He told me, 'General, this isn't my first rodeo.' He had had the opportunity to drop 500-pound bombs before and had trained to do this. The procedures and techniques that he used on our ranges were incredibly useful to him. His story helped me focus on why our range spaces are absolutely critical to us." Lack of clarity in current environmental laws has the potential to put range use, and consequently pilot readiness, at risk, Foglesong added. "Our range space is under scrutiny every day," Foglesong said. "Unless we have some clarification in the current status of the laws, our concern is that we will shrink and shrink and shrink, when we actually need the ranges we have now and possibly even more."